A discrete-time dynamic model of a financial market is developed, where two types of agents, fundamentalists and chartists, allocate their wealth between two risky assets and a safe asset, according to one-period mean-variance maximization. The two groups of agents form different expectations about asset returns and their variance/covariance structure, and this results in different demand functions. At the end of each trading period, agents' demands are aggregated by a market maker, who sets the next period prices as functions of the excess demand. 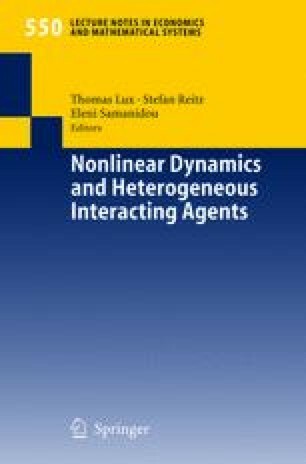 The model results in a high-dimensional nonlinear discrete-time dynamical system, which describes the time evolution of prices and agents' beliefs about expected returns, variances and correlation. It is shown that the unique steady state may become unstable through a Hopf-bifurcation and that an attracting limit cycle, or more complex attractors, exist for particular ranges of the key parameters. In particular, the two risky assets may exhibit “coupled” long-run price fluctuations and time-varying correlation of returns.